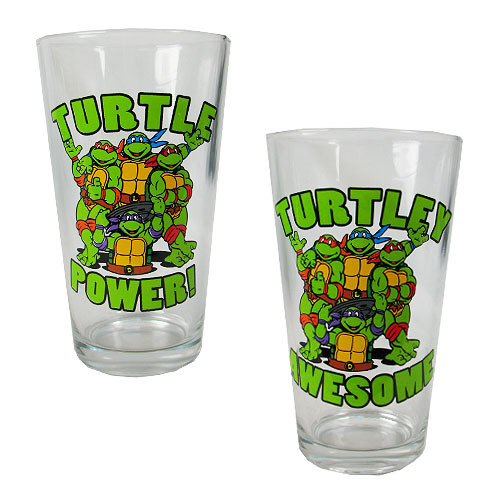 Shopping for Teenage Mutant Ninja Turtles Pint Glasses? Share a drink with the turtles! This Teenage Mutant Ninja Turtles Power and Awesome 16 oz. Pint Glass 2-Pack features a group shot of all four turtles, with the words "Turtle Power" on one and "Turtle Awesome" on the other. Glasses come in a full-color open-window gift-box package and hold up to 16 ounces of liquid each. Hand wash only. Not dishwasher safe. Do not microwave. Ages 12 and up.